Who knew that a relatively obscure signing would turn into one of the most important players for the team of this decade? Thanks to the Steelers' surplus of outside linebackers, Vrabel became a free agent after the 2000 season. He signed a three-year, $5.29 million contract with the Patriots. 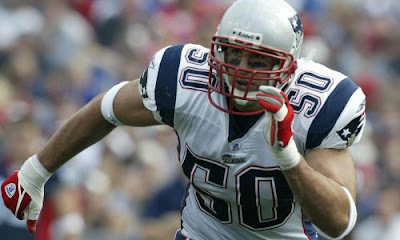 In eight seasons with the team, Vrabel collected 48 sacks, including 12½ sacks during the 2007 season. He was selected to his first Pro Bowl that season. Also in New England (including during the playoffs), Vrabel caught 10 passes, with all 10 going for touchdowns. He had touchdown receptions in Super Bowl XXXVIII versus the Panthers and Super Bowl XXXIX versus the Eagles. Vrabel will take his act to Kansas City because he was traded with QB Matt Cassel to the Chiefs on Feb. 28.